The title Guanghan Qiu survives in only four handbooks, the same four from 1425 to 1670 that tend to copy Shen Qi Mi Pu melodies from the earliest sources.4 All are virtually identical to the SQMP version, but have no additional program notes. "Guanghan" is the name given to a palace said to be on the moon,5 hence it can also refer to the moon itself. On a basic level, then, the title here might also be translated simply as "Autumn Moon". Zhu Quan's preface elaborates on this somewhat by alluding to legends connected to the moon while rhapsodizing on feelings evoked when encountering the moon on a cool evening in autumn. According to legend Chang E/Heng E lives in her moon palace with a three-legged toad,8 a rabbit,9 and the woodcutter Wu Gang.10 One legend says that Chang E was once married to the archer Hou Yi.11 Hou Yi was given the elixer of immortality in return for using his arrows to shoot down extra suns which had appeared in the sky, but Chang E tricked him out of the elixir and drank it herself. In anger Hou Yi began shooting arrows at her, so she fled to the moon, where she was turned into a three-legged toad. 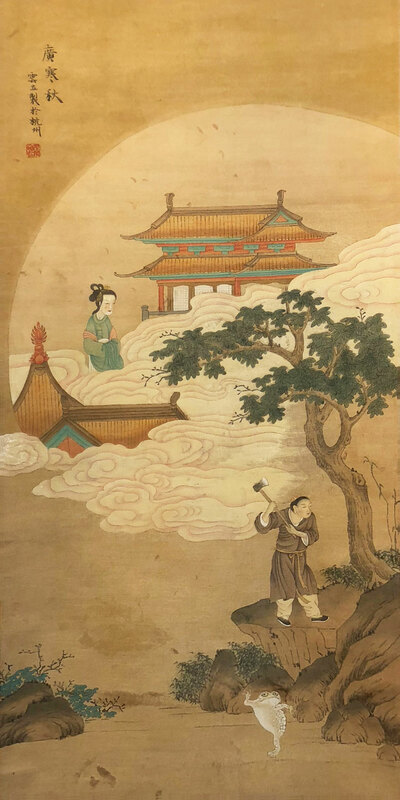 Meanwhile Wu Gang, who as an alchemist had also offended the gods, was condemned to live on the moon until he could chop down (zhe) a certain cassia tree (gui), known for its red color. However, each time Wu Gang makes a cut, the trunk grows right back. Hence, "chopping down a cassia tree" (zhe gui) came to mean accomplishing a very difficult task (like passing the imperial examinations). It is a zhe gui story that apparently connects Guanghan Qiu to the poetic rhythm12 of that name, as well as to the story of a Yuan opera.13 The titles of these can be Guanghan Qiu, but the latter in particular was perhaps better known by the title Zhe Gui Ling (Cutting down the Cassia Tree Melody).14 These concern a scholar passing the imperial examinations. However, although Zhu Quan was also a writer of and expert on opera, there is nothing specific to connect this melody with any of the opera stories. Besides my own, there are no other recordings of this title. as for this piece it is as though, during the clear autumn season, nights are cool and people are tranquil; the heavens are vast and bright, the moon [toad] ascends gloriously, and the moon [goddess] is beautiful. A pure fragrance spreads throughout the universe, and red cassias seem to float around in the [Nine] Heavens. This piece has the joy of wandering to and fro while doing what one wants. How could a commonplace person achieve or understand this? So these interests are best expressed on the qin. Only people who eat the wind and drink the dew can attain this. 9693.205 "廣寒秋﹕詞牌名，即折桂令。 Guanghan Qiu: cipai name, same as Zhe Gui Ling." The entry then quotes a story called Guanghan Qiu from 輟耕錄 Chuo Geng Lu concerning 虞邵菴 Yu Shao'an (i.e., Yu Ji) while he was in the 翰苑 Hanlin Academy. For more on the SQMP melodies that tend also to be found in only these later handbooks see a footnote related to text in the Shen Qi Mi Pu general introduction. 5. 9693.200 廣寒 guanghan; for a discussion of the lunar palace, see also the melody Guanghan You. There is a later qin melody called 中秋月 Mid-Autumn Moon. Neither melody makes any mention of the popular customs associated with this festival, such as moon cakes, lanterns or matchaking. This toad is often depicted dancing; toad hall (蟾宮 chan gong, as on my logo) is another name for the moon. The rabbit (a.k.a. the 白兔 white rabbit or the 玉兔 jade rabbit) has also been associated with the moon since antiquity; it is said to use a mortar to pound cinnamon sticks on a pestle in its attempt to make the elixir of immortality. 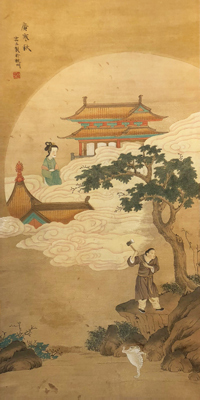 Wu Gang spends all his time trying to chop down a tree which keeps growing new leaves; however, he was able to stop long enough to defend Heng O. This punishment of Wu Gang - to 折桂 zhe gui - is apparently used as an allegory in the story called Zhe Gui Ling. (See also section title 5 of Guanghan You. Hou Yi is the title of 有窮 You Qiong, a famous archer of antiquity. "Strongman Jiao" and others later claimed descendancy from him. After Chang E stole his elixer of immortality he is said to have changed from hero into tyrant. 12. 詞牌 cipai; Ci for Qin discusses their use as qin lyrics. 12168.84 Zhe Gui Ling says 曲牌名 name of a qupai, i.e., Yuan opera; it then mentions seven other names for Zhe Gui Ling, including Guanghan Qiu. However, it does not seem to mention a specific story. Zhe Gui is also part of title of an apparently lost qin melody called The Scholar Chops the Cassia Tree (Youren Zhe Gui). 15. For the original Chinese text see 廣寒秋. 16. For the original Chinese section titles see 廣寒秋. Further comment above; based mainly on Zha Fuxi's Guide, 4/45/--.